Blonde (Collins English Dictionary definition) — Adj. 1. (of women’s hair) of a light colour; fair 2. (of a person, people, or race) having fair hair, a light complexion, and, typically, blue or grey eyes. –n. 1. a person, esp a woman, having light-coloured hair and skin. Blonde (Ash Robbins definition for this blog)–n. 1. a woman who has attempted to embody the idealized concepts of perfection in both appearance and life through materialistic and shallow means in an attempt to win the admiration of strangers. Undone (Ash Robbins definition)– I’ll take Mr. Collins’ #3 and #4 on this one. So there you have it; the fancy-smancy way of giving you the low-down on what this blog’s all about. Now, here’s the down-to-earth, girlfriend-to-girlfriend way of doing it– Hello, I’m Ash and I got tired of trying to be what I thought other people/society wanted me to be instead of being what I wanted to be. I’ve decided to stop conforming to things I don’t agree with just because I’m afraid of what other people will think. I’m untying the ropes of social and material trappings and reclaiming an authentic life and an authentic self. In other words, this blonde is coming “undone”, and this blog is here to chronicle my journey, encourage others to embrace their true selves, and to provide me with some therapy that doesn’t require a couch and an odd little man asking me about my mother. 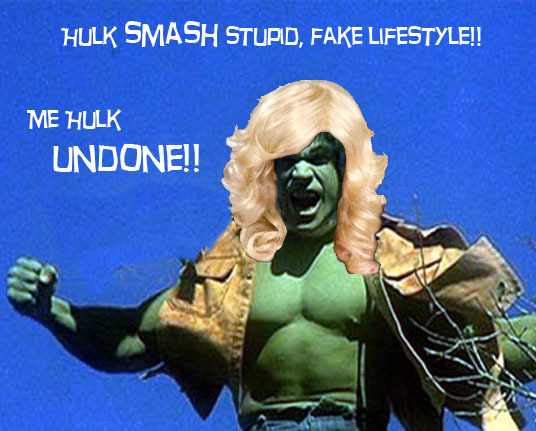 Hulk has always been a nonconformist, but who knew he was a natural blonde…or had those C cups? I don’t like labels (we’ll talk about that some other time), but for the sake of a quick description, I’m as ADD as they come. My thoughts are sporadic and seldom stay on track, so there’s no telling what I’ll be posting from day-to-day. But everything will link to my personal makeover as I tackle my demons one by one. Those demons may be something as deep as retraining a broken thought pattern or something not so profound, like organizing my junk drawer (don’t take that lightly; junk drawers are evil little bastards not to be underestimated). So if you want a safe place to hang out that’s full of honesty, humor, and, hopefully, some inspiration; come by and see what I’m up to. My hope is that it’s contagious and some other unhappy folks will find courage to change the things they want to change and be the people they truly are. Oh, and just to be sure you know, you don’t have to be blonde to join this club–hell, you don’t even have to have hair.